Since winning an American Book Award (for The Red Magician) in 1983, Lisa Goldstein has been a rising star. She has won the Nebula Award several times and has been nominated more than once for both a n Arthur C. Clarke Award and a Hugo. In the world of SF/F, then, Goldstein’s is not a new name. 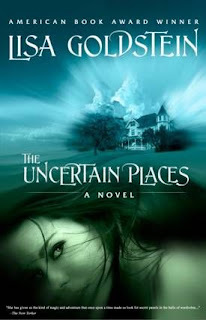 In The Uncertain Places (Tachyon), Goldstein is in fine form with a darkly compelling modern fairytale. It’s Berkeley in the 1970s and Will Taylor falls for chef and scientist Livvy Feierabend who proves to be just one of a tribe of mysterious women -- all related -- who made an ancient pact that will prevent Livvy from ever truly becoming Will’s, unless he can intervene.